Learn how to make udon noodles from scratch. 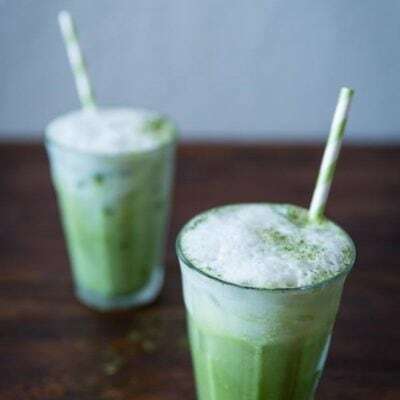 You’d be surprised how easy & fun it is once you give this homemade recipe a try! With a little bit of footwork (yes, read on to find out more), you’ll get some delicious homemade noodles that is far more superior than store-bought ones. One of the easiest Japanese noodles that you can make at home is Udon Noodles (うどん). 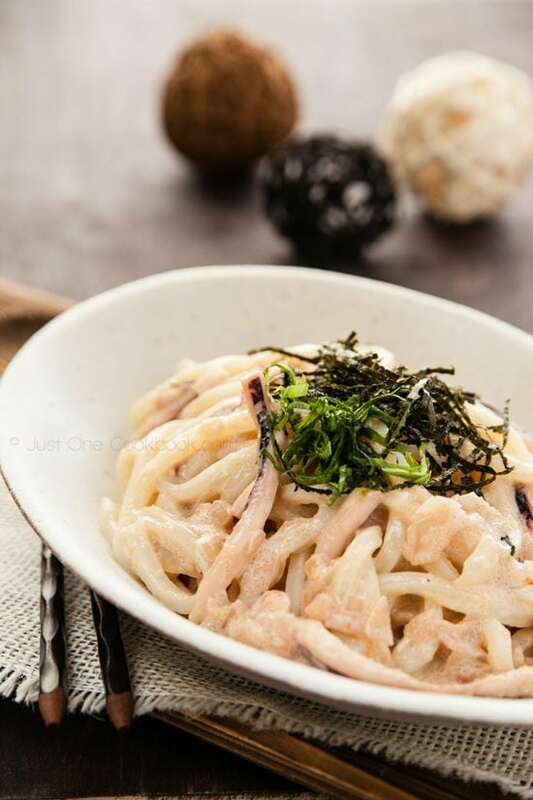 Today I’ll share with you how to make this popular Japanese noodles from scratch. Since Valentine’s Day is just around the corner, we’ll make a pink version for fun. How do we color it pink? We use homemade natural food coloring – beet juice! Why beet juice? I’m collaborating with other talented YouTubers for Tastemade‘s new “Hero Series“, and the ingredient for this month’s series is beets. At the end of my YouTube video, you will see the playlist of all the recipes so please check them out! Making delicious udon noodles at home requires just water, salt, and flour. 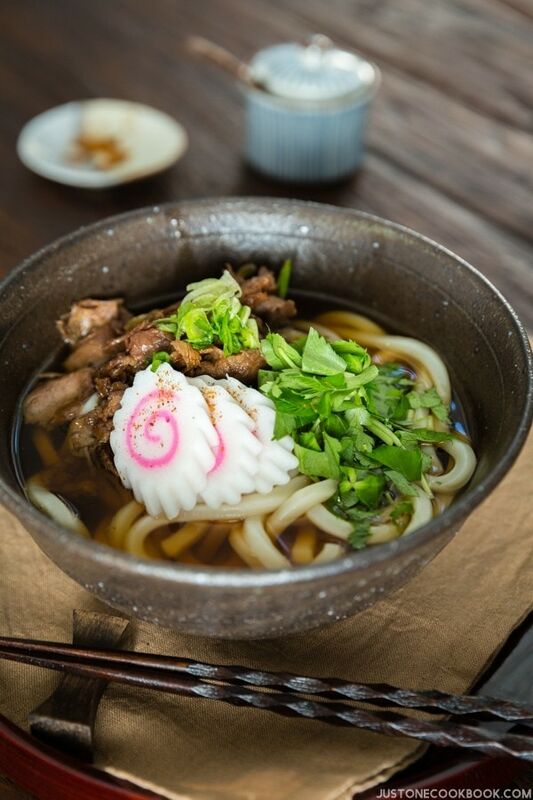 Nothing beats the flavor and texture of fresh homemade udon. 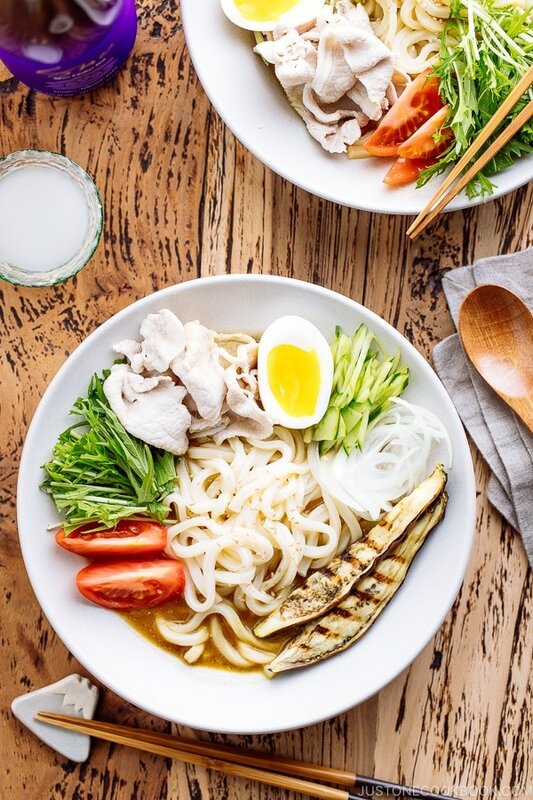 Living in San Francisco, it’s easy for me to access to all kinds of Japanese products and produces, including udon noodles. I always have this package of frozen Sanuki Udon in my freezer, so I don’t really have to make my own noodles. Then why do I make udon noodles from scratch? Fresh tasting and quality texture. The texture of refrigerated udon noodle packages sold in Asian markets are usually not of good quality. Not only the noodles break too easily, the taste tends to be floury and the texture can be rubbery. Homemade noodles? The texture is smooth and chewy with an elastic toothsome bite. The freshness is simply unbeatable. You only need 3 ingredients to make udon noodles: flour, water, and salt. The methods to make udon are very straightforward. No special kitchen gadget required. Unlike making pasta noodles, you need a pasta machine to make perfect noodles. 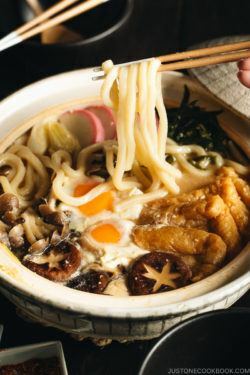 With udon, you only need your hands, your feet (read on to find out why) and a sharp knife to make the noodles from scratch. To be honest, there are a few drawbacks (but not big deal IMHO) with making udon from scratch. It takes time. To be exact, you need at least 4-5 hours including inactive time. The dough needs to rest to relax the gluten. It’s a bit of a workout. Considering you will enjoy the heavenly noodles, this is not too bad, right? Compared to bread dough, udon noodle dough is harder. You will need some strength to roll out the dough. And this leads to my third point. 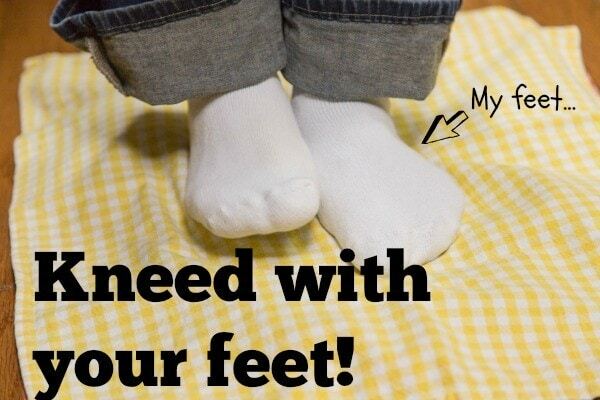 It requires your FEET. What??? Yes, I’m not joking. Because the dough is pretty hard to knead with hands, the Japanese use our feet to do the work. If I haven’t said yet I must tell you, IT’s SO WORTH IT! My family enjoys these homemade noodles every time I make them. The taste and texture are much better than any store bought brands, including the best ones. And there is no preservatives used in homemade udon. The ingredients and methods for making udon noodles are very simple. I recommend the following measurements for one serving. * 45 grams of water means 45 ml/cc. For the best result, please use a kitchen scale (I started using it more so that I can give you precise measurement). I purposely didn’t include a “cup” measurement (I’m sorry!) as 1 cup of flour varies depending on how you measure it, whether it’s been sifted or not. It’s the most accurate when you measure by weight. Do not skip “resting” time. I know, we are all busy and we don’t have time to wait around. However, in order to achieve good chewy udon texture, hang in there, at least for your first try! I actually have tried skipping the rest time and made a quick version of udon. They turned out okay, and probably better than those refrigerated udon noodles from the stores, BUT they are not comparable to the ones that have enough resting time. Get a 5 gallon Ziploc bag if you are making more than 2 servings. If you have a clean thick plastic bag, then that’s okay too. Don’t use a thin bag because you might rip it. 1 gallon bags will be way too small for 3 servings and more. Knead with your feet until the dough is as soft as your ear lobes. It’s going to be much harder to roll with your hands later if your dough is not soft enough. 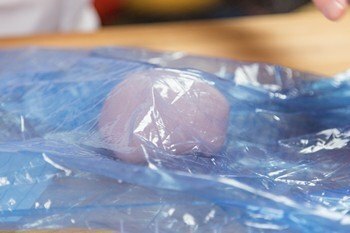 Cover your dough with a plastic bag when you are resting it. This is to keep the moisture in the dough, and remove as much as air as possible. Roll out the dough to a square shape so that the noodles will be of equal length. 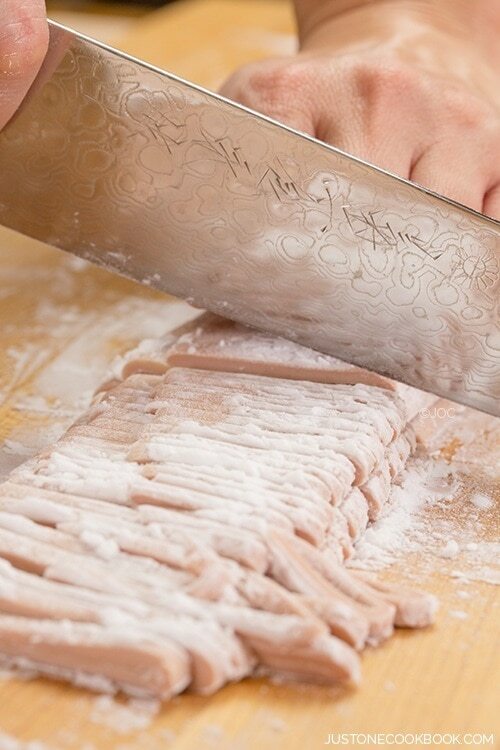 Use a sharp knife to cut the noodles. If it’s a dull knife, the sides of the noodles will not have a clean cut. Part of the texture that makes udon unique is its clean edge. So… Beet Pink Udon, Yay or Nay? I personally loved it, even though I’m pretty traditional when it comes to Japanese food. The best part is that you don’t really taste the beets. I mean, I can sense it, but it’s definitely not a significant amount of flavor. I’m comfortable to serve it to someone who is not a big fan of beets. Depending on how you serve these udon, you are not likely to taste the beets at all. The shade of pink really depends on how much beet juice you use. I have tested enough times that I know exactly how much beet juice I wanted for this recipe, but you have to slowly combine the water and beet juice to achieve the right shade of pink you want. My daughter LOVES these pink udon noodles. I guess I don’t have to wait until Valentine’s Day to make these colored udon noodles in my house. 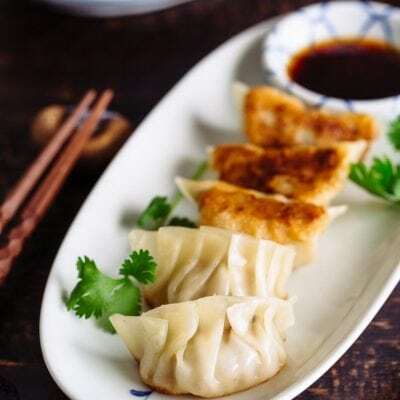 If you enjoy making food from scratch, like these Homemade Gyoza Wrappers, you will definitely enjoy making udon noodles in your own kitchen. Have fun! Gather all the ingredients. If you are making white udon, skip to step 5. Peel and slice the beet root into ½” (1.3 cm) thickness. Put sliced beets and 1 cup of water in a small saucepan and cook for about 20 minutes until the beet juice is reduced to about 2 Tbsp. Save the beet juice in a small bowl. Combine 80 g (80 ml) water and 2 tsp. of beet juice. Add the 2 ¼ tsp. salt and mix until it’s completely dissolved. Combine 90 g (90 ml) water and 2 ¼ tsp. salt and mix until it’s completely dissolved. 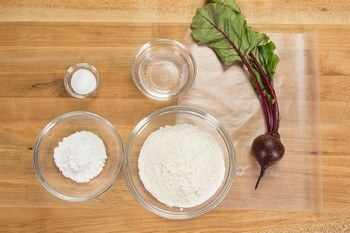 Place the flour in a large bowl and add the salted beet juice (for pink udon) or salted water (for regular udon) little by little while mixing with hands. Combine the dough until there is no dry flour left and form into a ball. If there is some flour left, add tiny bit of water. Then place the dough in the large durable plastic bag (such as 5 gallon Ziploc bag). Close the bag leaving a small air gap and leave it for 20-30 minutes to relax the gluten. Just in case the plastic bag breaks, place the bag between 2 kitchen cloths on the floor. Step on the dough with your feet (heels) using your weight. Turn around and press from the inward to outward. You can do this step with your hands, but it will take more effort and time. Stepping udon dough with your feet is a common practice in Japan! Step on the dough until the dough is completely flatten. Take out the dough and fold it into a ball again. Place it in the bag and close the bag leaving a small air gap. Step again until the dough is stretched and flatten. Take out the dough and fold into a ball again. Prepeat this process one more time (total 3 times), or until the dough is soft just like ear lobe (that’s how we say in Japan). After the 3rd round of stepping the dough, fold it into a ball and place in the plastic bag. Seal tight and rest the dough for 2 hours (3 hours or overnight in winter). Dust the working surface with potato/corn starch and take out the dough. Form a nice round ball and then flattern with your hand. Using a rolling pin, stretch the dough into a rectangular shape. Dust the dough with portato/corn starch in between to make sure the dough is not sticky. Turn the dough 180 degree and stretch it evenly. Once it’s nice rectangular shape, turn 90 degree and stretch to make it into square. If the dough is square, all the nodles will have the same length when you cut them. When the dough is a square shape, roll the dough into a rolling pin and stretch to let the rounded corner into more pointed tip. Make the dough into 3 mm (1/8”) thickness. Dust the potato/corn starch on top of the dough and fold the dough like an accordion. Put more potato/corn starch on top and then cut noodles into 3 mm (1/8”) thickness. Pick up some noodles and fluff the noodles to make sure the noodles are covered with the potato/corn starch to prevent from sticking to each other. If you cook immediately, boil a big pot of water (do not add salt) and cook for 10-12 minutes (depending on thickness of your noodles). Stir the noodles so they don’t stick to each other. Drain and rinse well with cold water to remove the starch. 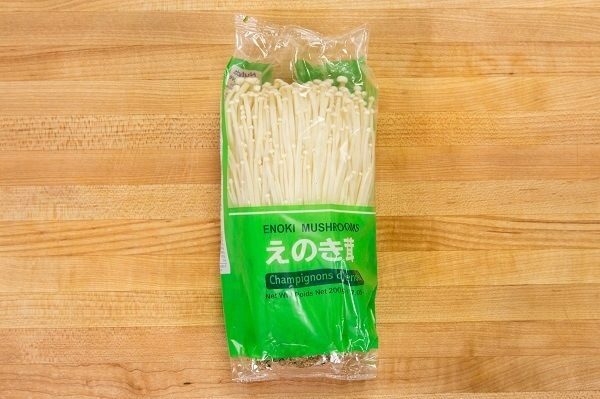 Drain and they are ready to use for your favorite udon recipe. If you don’t use the udon noodles right away, divide them into small portions (100-150 g per person) and freeze in an airtight containers/bags for a month. You can refrigerate for a few days but it tastes better when you freeze the fresh udon right away. To cook frozen udon, boil for 12-13 minutes without defrosting. I was originally thinking of just making a simple salad for tonight’s dinner, but this post has completely changed my mind. I’m excited to try it out, and use the tips you gave for rolling out and cutting the dough. Also, congrats on your first video appearance! d ^_^ d I’m sure your readers will love meeting you this way—I know I did! Gorgeous looking noodles. I’ve yet to try udon in any form but making them from scratch seems like a fun project to try. I haven’t had time to watch the video yet but I’m sure you did a great job. Loved seeing you in your video, Nami. As always, you make everything seem easy. But I missed hearing your kids at the end! I wouldn’t even think of making something like this from scratch! 🙂 You did amazing job. YEYY!!! Even though we talked It’s great to see you and hear in the video…superstar! 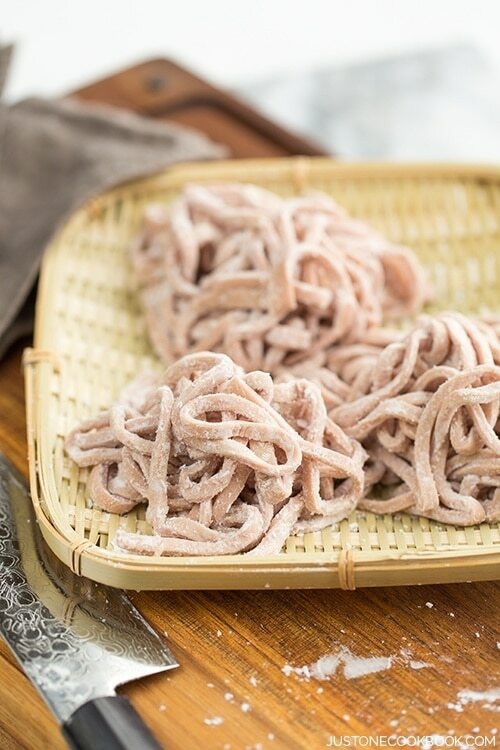 Love, love your homemade pink noodles! Hello Nami, I was very excited when I saw the preview on your Instagram. I tried making udon noodles from scratch before, but we didn’t like the texture of it, will try your recipe soon! Love udon noodles. Hate to tell you I have two packets of dry ones from the supermarket in my kitchen at the moment. And it is not hard and my leg muscles could well do with the exercise 🙂 ! Shall try within the next week!! And Nami: will you please appear in all or at least most of your future videos! Love the way you present and your beautiful soft way of speaking: would like to watch even if a particular recipe may not personally appeal!! Nami, you are so adorable in your video. You didn’t look nervous at all! I lived in Japan many years ago, and the foods you make take me back to the experience. I was so excited to find your website several months ago. I have two questions for you. First, that knife is beautiful. Do you mind sharing what brand it is? Second, do you think putting the dough through the rollers of a pasta machine would soften it in lieu of stepping on it with the feet (although that looks mighty fun!)? I am definitely putting udon noodles on my “to try” list. Thank you for everything you teach us. Hi Maria! Thank you for your sweet words! I was and still am nervous. I’m not very used to this kind of thing (all my life! )… I’m so happy to hear you enjoy my recipes. It’s wonderful to hear you got to live in Japan! So the udon dough is pretty tough. It’s very hard to roll out until it’s soften. So we use our feet first to make it soft…then you start rolling it with a rolling pin. I don’t have a pasta machine, so I don’t know how it can handle, but the dough is tougher than bread. 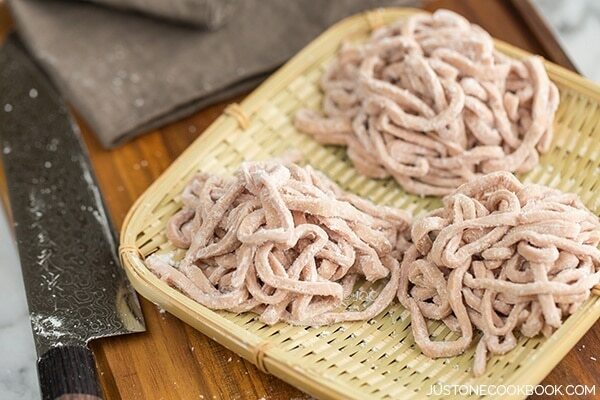 You can make the dough softer by adding more water, BUT the texture of udon will be less chewy and not so ideal. Fantastic job on your first video appearance Nami, you were great. As some of the other readers have said, this looks like a great recipe for the kids to participate in! You look great on the video! You’re a real natural. Love the opening “hi everyone” with the wave — very welcoming. Anyway, fun recipe. I’ve never even thought of making my own udon noodles — so easy to buy. But it looks like fun. And I’ve never kneaded with my feet before. 🙂 Terrific post — thanks. It was so nice to hear your voice and you didn’t appear nervous at all. This is one of the most interesting recipes I’ve come across in a long time! Looking forward to seeing you on camera again. All last summer and fall I was buying fresh Udon noodles from Costco., then around the holidays, they disappeared from the shelves. We have missed them terribly. Therefore, I am THRILLED to have your recipe and fun method! I can’t wait to start walking on the noodle dough. 🙂 Great video! You look good, Nami! Love to watch your tutorial videos. First time see pink udon! Very creative. Look forward to seeing you more in near future. Udon are my fave, and ramen. SO cool to know how to make it, and with feet! Hi Nami, you are ADORABLE!! Your instructions are fantastic and it’s so awesome to see you. Loved your previous videos (Ihaven’t been active at all for last few months and I aplogogize for missing out on a lot) but it’s so good to be back and see this. Love Udon noodles and whenever I eat it next I am going to remember you. Thank you so much Joy! I practiced sometime to make udon, but it’s really simple and easy process. It’s just a little time consuming (because of inactive cooking time) and you need lots of energy to knead the dough! 🙂 Thanks again for your sweet words! What a wonderful post about making udon noodles. I’ve always wanted to learn it. Your video is terrific and you look great, Nami — you should be on your videos more often! Thanks for sharing this recipe and happy blog anniversary again! Nami, you did a TERRIFIC job on your first video appearance! After all these years following your blog, it’s like finally getting to meet you 🙂 Just this afternoon I was thinking that I needed to stop by Nijiya to purchase more frozen udon noodles and wouldn’t have thought that I could make my own! I’ll give it try soon. Thank you! Wow, sooo love this, Nami! Thank you for teaching us these lovely Japanese DIYs. Please continue to do so. Can’t wait to start out on these udon noodles really soon!!! Love Udon noodles so much! Thanks for the detailed recipe. Feet kneading is a great idea. 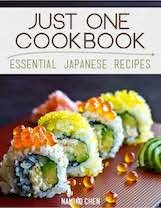 Will make this soon at home! A wonderful recipe! Very well explained. I love those noodles. Hi Linda! Do you mean whole wheat flour? I haven’t tried it but I think you need some adjustment as the dough tend to be harder with whole wheat flour and texture will not be the same. I wish I know the substitution amount but I’m not sure… Sorry I couldn’t help.. I loved this video! I’m definitely going to try making Udon Noodles this weekend. Thank you so much Nami! Hi Nami, Thanks for the great recipe. Just one question, do you freeze the uncooked udon in the freezer or cook it first then freeze? Thanks. Udon is my favorite noodle! Just like you, I keep frozen udon in my freezer, so I can have it any time I want. It is awesome that you make this pink with beet juice. Very pretty! And how fun it is to knead with feet! Great recipe, Nami! I’d love to try making these but unfortunately, I’m gluten free. 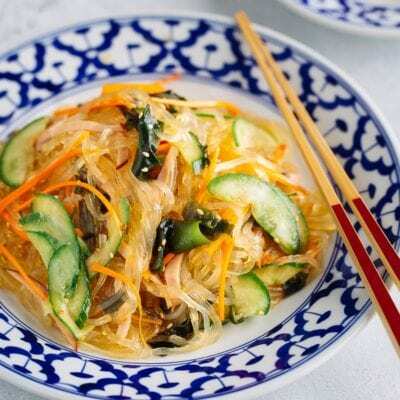 Do you think this recipe would work with gluten free all purpose or just rice flour? Hi Fayona! 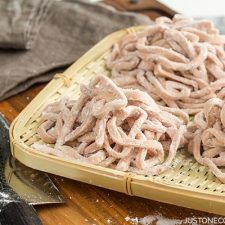 Unfortunately, I have not tried making udon with gluten free flour or rice flour but I found this recipe. I hope this helps! Can you just refrigerate the noodles overnight if you are going to cook it the day? Sorry, I meant the *next day. Thank you for your lovely recipe. I have made Udon 4 times follow your instructions. It tastes great except too salty. Is that correct to put 10 g salt into 80ml water for 200g flour? Before freezing for later use, do I boil or leave uncooked? Hi Rekha! Uncooked. 🙂 Hope you enjoy! We made the Udon noodles over the weekend and it was AMAZING! My husband kneed it with his hands and he thought it was totally worth the work. No more over priced Udon from the store! Thank you! Hi Lu! Yay! 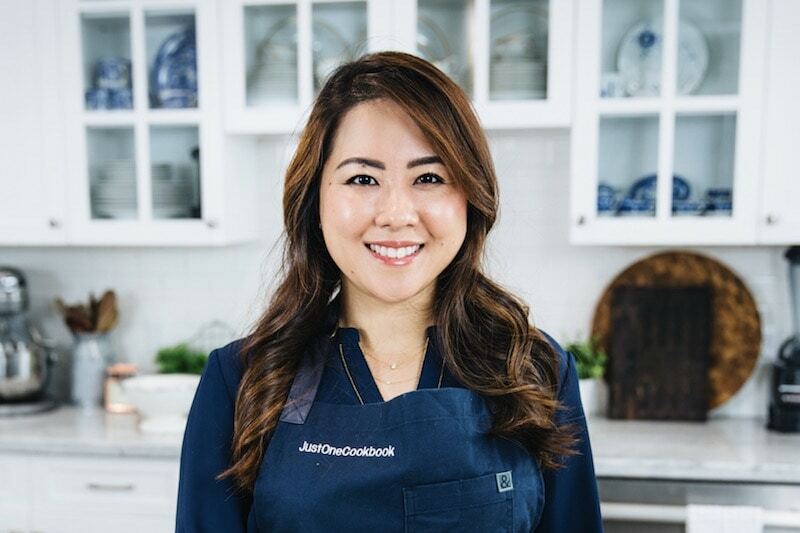 I’m so happy to hear you and your husband made this recipe! Awesome! Homemade udon is so good! I’m glad you tried it! Thank you for your kind feedback! Can I use kitchen aid for mixing? 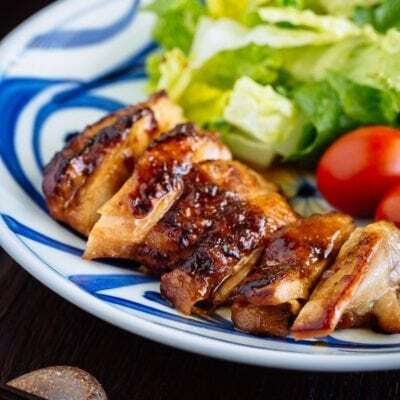 Happy Valentine days, yesterday i go to the japanese restaurant. I have eat a calamari udon and the taste is so yummy, and my husband ask me to cook it at home. Hi Kenken! Happy belated Valentine’s Day! Udon with calamari (squid) is not very common unless it was tempura squid (Ika Ten) on top. Was it? The udon broth should be similar to this broth. I’ve tried this twice now and the dough ends up soft? Hi Jim! It’s highly possible that your weather is more humid than dry California where I live. The amount I gave in the recipe is just a guidance as the amount of moisture in the air really matters. Hello, if I freeze the noodles, when it comes to cooking them, do I thaw them or not? Is the cooking time the same? Hi Kessia! Thank you for asking! I updated the recipe with the information! You do not need to thaw. Add the frozen udon and cook for 12-13 minutes, just a minute more than fresh one (depending on thickness too). Hope this helps! I tried your Udon and they were heavenly! Never going to buy frozen ones again! You are doing such a great job with your website and books, keep it up :)! Hi Jester! 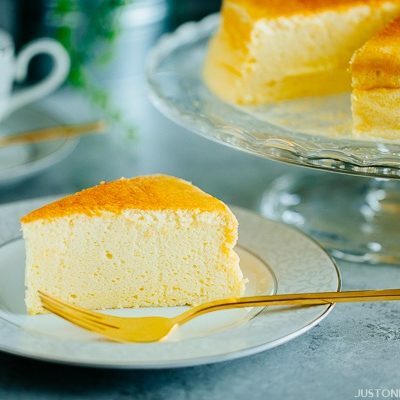 I’m so happy to hear that you liked this recipe! Right? It’s easy (but time consuming, I know) and homemade is so delicious! I still buy frozen Sanuki udon for my quick lunch option, but when I have time, I try to make homemade udon. Yeah, the ramen noodles have been on my list for a long time, along with making ramen broth from scratch (like from bone….). I just don’t have enough time to get through my list. 🙂 Thank you for your kind compliments! I tried this recipe. It is PERFECT! Never made or had fresh udon noodles before. Man oh man! You have created a monster now haha. I wonder if I’ll get fat off these?? Lol. Thanks so much for the recipe. I posted a pic on the Facebook page so you ccan see. I do have to work on the cutting of the noodles, but overall I was so happy. Thanks again. 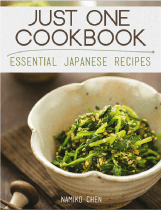 Hi I like your home-recipe Japanese noodles etc. 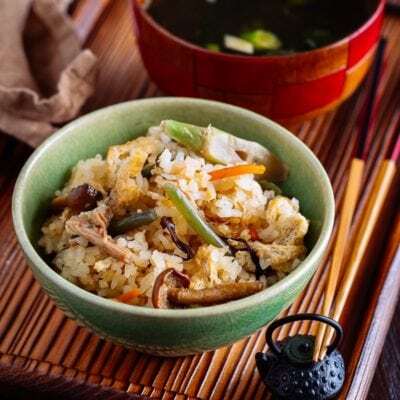 I wish to start a udon noodle cafe – i have been cooking black pepper chicken udon – stir fried for my children and they just love it. We are running short in finance and my kids encourage me to take my cooking public and make a living of it. How do you store udon noodles for say a few days. Do you boil them and freeze them. Can you advise me? 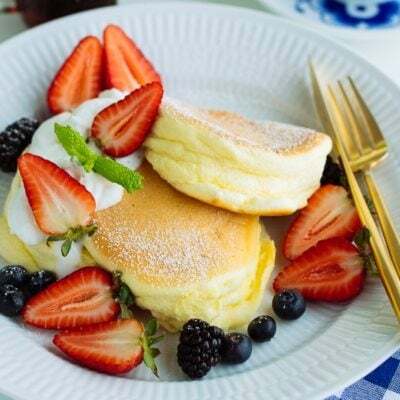 I like your website because your recipes are home recipes, the best from a Japanese mother and besides yours is like a one stop shopping centre. Thank you in advance. I’ve had GF noodles before but they are all made with rice flour (but it tastes like regular udon). I mentioned to another commenter above, but found this GF udon recipe onine. As I have never worked with GF all purpose flour to make this recipe, I can’t tell how much water is necessary etc… that will affect texture of the noodles. If you try it, let us know! 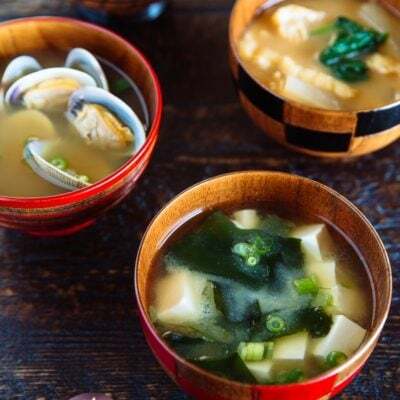 Hi Nami – thanks for the udon recipe! I’m actually about to try this recipe next week for my family with the left over カレー sauce I have from your recipe 🙂 one quick question – this seems like a lot of salt. Is it possible to reduce the amount, or does a lot of it escape while boiling the udon? Thanks! Hi Charlotte! I hope my answer is not too late. The salt is necessary amount. When I was studying the recipe, I looked around, and it’s pretty standard. I wouldn’t play with salt too much. Hope this helps. I think it should be noted that the water should be unsalted so the noodles can release some salt during cooking, and IMO a lower protein flour (cake vs bread, for example) works better. Hi Jędrek! Thank you for pointing that out. I edited my recipe mentioning that no salt necessary. I didn’t think about that as we don’t use salt for boiling udon and soba. Thank you for sharing your tip also! Just posted a question about this before reading the other comments, thank you! So do you freeze the noodles before coming or after if you aren’t going to use them all right away? Hi Hollie! You can freeze the uncooked udon noodles that you don’t need to cook. Thank you for this fine recipe. I just made these and they look great. Also kudos for using the metric system! It makes it so much easier for us people from outside of the Anglosphere. is ‘all purpose flour’ the same thing with ‘wheat flour’? Hi! I’m planning to make udon with my preschooler soon, she’ll love the idea of kneading with your feet. I have 2 questions. 2. Is it possible to make udon with a pasta maker, instead of cutting with a knife? Or is it not flat enough to go through a pasta maker (or too hard and gets stuck or?)? The knife sounds easy, but my kiddo adores using the pasta maker, haha. Hi Rebecca! Hope your children will enjoy making homemade udon noodles! Hope your family will have fun making noodles! Lovely!!! I’m from SF, but living in Osaka. My wife and I have loved sanuki style udon, but it’s so difficult to find them from the store in Osaka. We just made this (for the third time) for friends, “kama-tama” style! We all had fun making it together, and fell in love with handmade noodles. Thanks for the simple and delicious instruction (and for noting the importance of using your feet.. much easier and more fun). You rock. Hi Patrick! Aww thank you for your kind comment! We were in Osaka early August too! 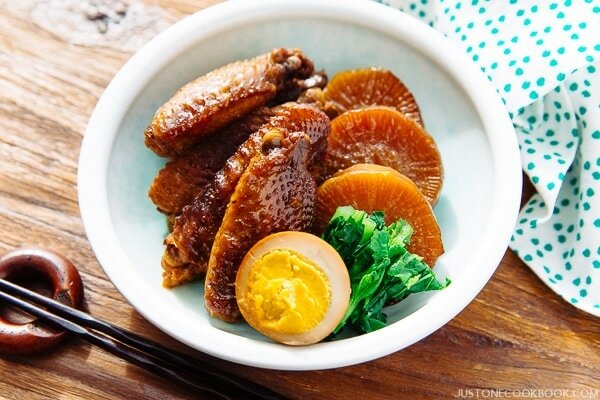 Really happy to know that you and your friends enjoyed this recipe! And your work is very interesting!! Made the regular udon noodles (not pink) and they were amazing! These were so easy to make and turned out delicious! I can’t believe it’s such a simple recipe!